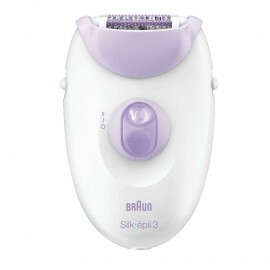 Braun Silk-épil 5 5-329 Power epilator - non-stop power for non-stop smoothness. Never wait again for your body hair to grow so that wax can get it. 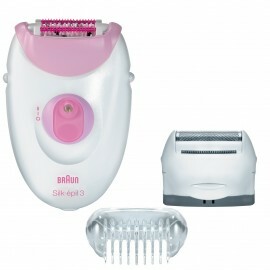 Braun’s specially designed Close-Grip 40 Tweezer technology catches hair as small as a grain of sand (0.5mm) - no more in-between days, no more hassle. The pivoting head of the power epilator follows every contour of your body for better skin contact and even gentler performance. The Smartlight reveals even the finest hairs for extra thorough hair removal and the massage rollers & cooling glove help make epilation more comfortable - with regular use, it becomes virtually painless. Designed for uninterrupted use in dry conditions, it never lets you down. 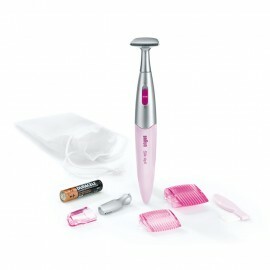 "With 3 extras: massage cap, cooling glove and facial brush for 6x better cleansing vs. Manual 40 Close-Grip tweezers remove even the shortest hairs for up to 4 weeks of smooth skin Outperforms wax – catches hair 4x shorter. Massage rollers and a cooling glove help make epilation more comfortable Designed for uninterrupted use in dry conditions, it never lets you down The Smartlight reveals even the finest hairs for extra thorough hair removal The pivoting head follows every contour of your body for better skin contact and even gentler performance Braun Silk-épil 5 Power epilator - Non-stop power for non-stop smoothness.